Awesome holiday treat, my second WOD with mom in three days! A natural born deadlifter. Today is a CrossFit nerd’s dream. Bars Banging. Weights flying. Technically demanding. Controlled chaos! Use the comments section below to communicate about when we will be arriving, as we will have to run the workout in heats, instead of all at once. There will be three stations: two with standard Olympic bars and one with the lighter training bars. There is an On Ramp class from 9-10. Feel free to get in a bit early to warm up so the first group can start right around 10 o’clock exactly. Conversely, feel free to note if you are hungover and planning on arriving a bit later. 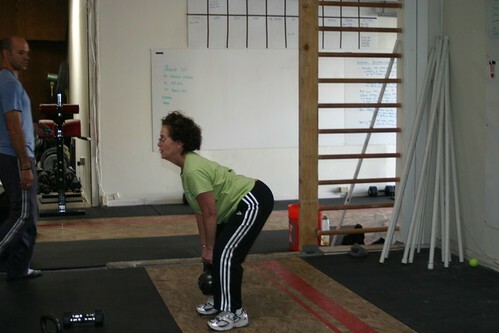 There will be scaled stations set up with kettlebell deadlifts, weighted push ups and dumbell cleans. Let me know if you have any questions. See you there…stormin through some bars!